When Allen Lessels was my sports editor at the Portland Press Herald many years ago, he was always challenging me to do stories outside my comfort zone. If it weren’t for him, I probably wouldn’t have called the Boston Celtics up in 1982 and asked for an interview with Red Auerbach. I certainly wouldn’t have been as persistent about getting Joan Benoit Samuelson to talk to me a week before she left for the Olympic Trials in 1984. Allen, who covers UNH sports these days, had heard that I’d declined the invitation to play when assistant UNH coach Kelsey Hogan invited people via email a few weeks earlier. I told Kelsey I’d be there for lunch and would attend the UNH women’s game that afternoon, but that I couldn’t play in the alumnae game that morning. Although I play 3-3 half court basketball twice a week, the last time I ventured south to connect with other basketball alumnae was probably 8-10 years ago. I hadn’t run full court, except for an occasional layup drill with my high school freshmen, for several years. I had visions of me gasping for air after two times down the court. The thought of going up against women who’d graduated from college only 2-3 years ago also seemed a little silly, if not downright dangerous. Tip off at the Alumni Day game. It was great to be on the floor of Lundholm Gynmasium again! I ended up more than happy that I played. I connected with some older alumnae from the early ’80s (whom I’d gotten to know the year I taught at UNH). And I guess you could say I held my own in the game (though I was grateful for my help-side defenders on more than one occasion). The highlight of the day, though, was meeting a woman who played ball at UNH in 1949 (no, she didn’t play in the alumnae game). Phyllis Martin, from Newport, NH, majored in physical education and until a couple of years ago was still skiing down Mt. Sunapee near her hometown. She still rides her bike every day and remembers clearly the games she played at New Hampshire Hall way back when. According to Kelsey Hogan, this year’s Alumni Day garnered the largest turnout ever (more than 30 women came for some or all of the day). 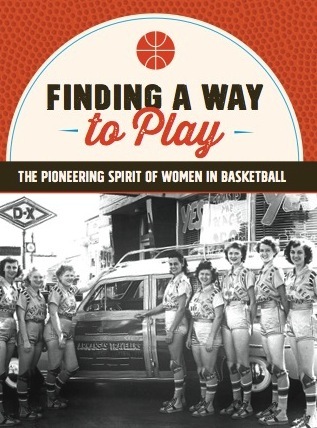 That Phyllis and I were two of them is a testament to the bond that playing basketball creates among women of all ages. It’s a bond that keeps us coming back, even if we need a little push out of our comfort zones.